I don’t normally write about wine, mostly because it’s a little out of my range of expertise. I’m not totally unschooled, but all that means is that I know just enough to have caught a glimpse of the staggering, Himalayan breadth of my own ignorance. But this is a Maynard wine. For those who don’t know, in addition to being the lead singer of Tool, A Perfect Circle, and Puscifer, Maynard James Keenan is a fledgling winemaker. His stuff is very small production and somewhat bizarre in that he owns vineyards in Arizona and New Mexico as well as California. He likes strange varietals from uncommon places, which, if you too are gushingly familiar with his work, you’ll agree fits. We picked up a bottle the other night, and as a once rabid Tool fan and pan-Maynard appreciator, as well as a professional drinker of drinks, I thought I would say a small something about it. Also, there’s really no other information about it online, and I’ve always thought of myself as the Julian Assange of the San Diego alcohol-based blogosphere. Merkin vineyards are one of Keenan’s labels which sources grapes from California, Arizona, and New Mexico. 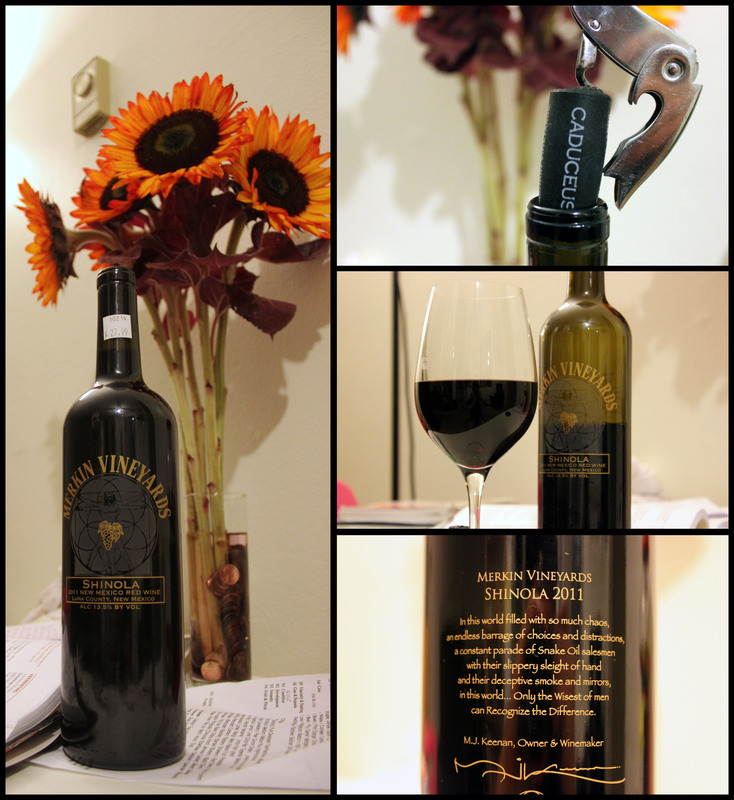 Apparently the Shinola used to be a Merlot/Cab wine from California, but it’s migrated southeast, and the 2011 Shinola is entirely a New Mexico wine. It’s an Italian blend, equal parts Sangiovese, Dolcetto, Refosco, and Primativo, spent 10-12 months in new and neutral French oak, and retailed at the 3rd Corner for about $28. Nose: not too stong. Dark fruits, cedar. Vikki picked up a little steminess. Taste: Initially tart and withheld. Waiting for an explosion that’s not there. Very tannic, tight. Plums, dark cherry. Slightly flabby. A few hours to open up, and the fruit is much more expressive and the tannins loosen up. Still could use more acid, but not as bad as it was initially. Finish: Initially dominated by tight, clammy tannins. Once it opens up, finish becomes longer and more balanced. Medium length. Overall: I really wanted to love this, and initially we were both terribly disappointed. It was a tannic monster, maybe too young. For all Italian grapes I was expecting more acidity to balance, but perhaps that reflects the difficulty in growing grapes in New Mexico. The fruits were clammy and lingered with sweetness in the corners of your mouth. After a few hours, however, we revisited it and found that most of the problems I had with it were at least mostly gone. The fruits were more expressive and the tannins more balanced. Still not without flaws, but at least the winemaker’s vision was coming though a bit clearer. If you get a bottle, be sure that you decant it. Bottom Line: There are way better bottles of Italian reds for $28, but none that come from New Mexico or are made by rockstars, and that’s essentially what you’re buying. It was more than enough to satisfy my curiosity, but I can’t say that I’d buy it again. What I do like about this and the rest of the Merkin/Caduceus/AZ Stronghold wines is that Maynard likes making unconventional things, and as I’ve said before, it’s always fun to try something new.